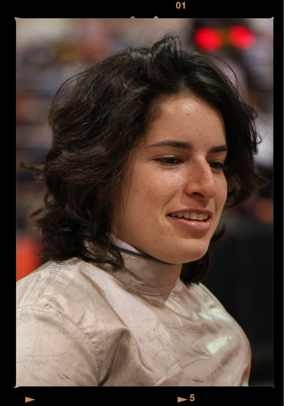 Lauren started fencing at the age of eleven because she quit ice-skating. Her older brother was a foil fencer so she started fencing. Lauren’s first weapon was the foil, just like her brother’s, but her heart was on the saber from the beginning, because “it is awesome and one can slash while fencing.” Once she started saber there was no going back to foil. Saber became her true passion. In her fencing career Lauren believes that it took her a long time to earn her “B” rating, but then shortly after she earned her “A” rating as well. The 2011 Summer National Championships in Reno, NV brought Lauren quite a few athletic accomplishments. Not only did she earn her A at this tournament, but she also earned two medals. It was Lauren’s best nationals so far in her fencing career. Lauren really likes fencing because she made lots of friends from all over the world, she traveled a lot to different US cities, and starting this fall she is going to be part of the NCAA fencing team at Temple University in Philadelphia, PA.